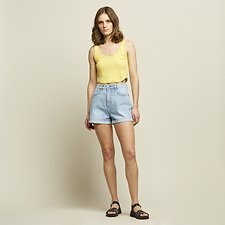 The very popular, Stevie short is inspired by the great decade that was the 90s. It's a high waisted short, with relaxed fit through the thigh and rolled cuff. Finished in a washed vintage blue denim.